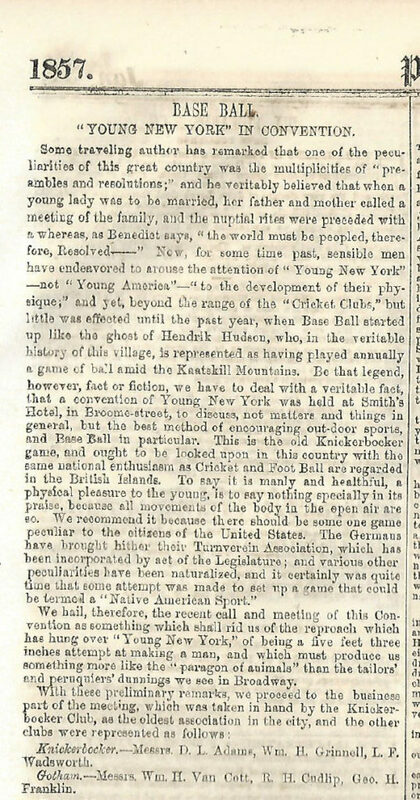 Porter’s Spirit of the Times reported on the 1st ever base ball convention held in New York City. Doc Adams nor only participated as a representative of the Knickerbockers but was also named as president. 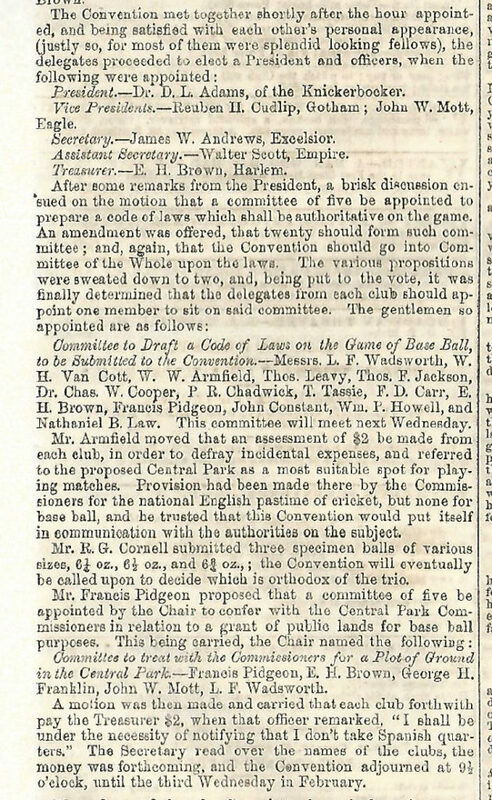 The Laws of Base Ball were the result of this convention and established Doc as one of the founding fathers of the game. As John Thorn, the official historian of MLB, stated in Doc’s SABR Bio project profile, “For his role in making baseball the success it is, Doc Adams may be counted as first among the Fathers of Baseball”. The 1857 Convention of Base Ball Players met for the first time on January 22 at Smith’s Hotel, the headquarters of the Knickerbocker Club, with the following clubs represented: Knickerbocker, Gotham, Eagle, Empire, Putnam, Baltic, Excelsior, Atlantic, Harmony, Harlem, Eckford, Bedford, Narrau, and Continental. The clubs elected Daniel Adams of the Knickerbockers as president of the convention and then appointed a rules committee, made up of one member of each represented club. This was perhaps the most important meeting in the history of baseball. It was a meeting of the baseball clubs of New York City, and unlike the previous meeting in 1854, it became the basis for a permanent organization that a year later would take the name the National Association of Base Ball Players (NABBP). More details on the convention can be found at Baseball Chronology.